Cauliflower can take the place of potatoes in lots of recipes—curries, stews, roasts—with little adaptation. When baking or frying are involved, however, cauliflower's higher water content makes it more challenging: how, exactly, can we get rid of all that extra moisture? The solution here is easy: squeeze it! After cooking and mashing the cauliflower, you simply need to apply some pressure, pressing as much moisture as possible out of the cauliflower so the final tots are crispy and delicious without a potato or deep-fryer in sight. As with traditional tater tots, these are tasty with ketchup. They're also good with a garlicky homemade aioli or a spicy mix of mayonnaise and Sriracha. Also, like their potato brethren, these don't get better sitting around, so be sure to serve immediately! Bring a pot of salted water to a boil. Meanwhile, cut the cauliflower into evenly sized florets. When the water comes to a boil, add the cauliflower and cook until the florets are very tender, about 10 minutes. (You can also steam the cauliflower to cook it, if you prefer.) Drain the cauliflower and spread it out on a baking sheet to cool. Once the cauliflower is cool, mash it. A potato masher or ricer works, as does a large fork. You can also pulse the cauliflower in a food processor. Transfer the cauliflower onto a clean kitchen towel or layers of cheesecloth. Pick up the sides of the cloth, twist it into a bundle, and squeeze as much water as you can out of the cauliflower. Really go for it—the more water you get out now, the easier it will be to form the tots and the crispier they will be later. Whisk the eggs in a large bowl. Whisk in the cheese, flour, salt, and pepper. Stir in the cauliflower and combine everything thoroughly. Line an 8-by-8 inch baking pan with plastic wrap or wax paper. Spread the cauliflower mixture evenly in the pan, cover, and chill for at least 1 hour and up to overnight. Preheat an oven to 400 F and liberally spray a sheet pan or baking pan with oil. Lay whatever breadcrumbs you'r using on a rimmed plate or in wide shallow bowl. Lift the cauliflower mixture, plastic wrap and all, out of the pan and onto a cutting board. Cut into 36 even pieces (6 rows each direction). 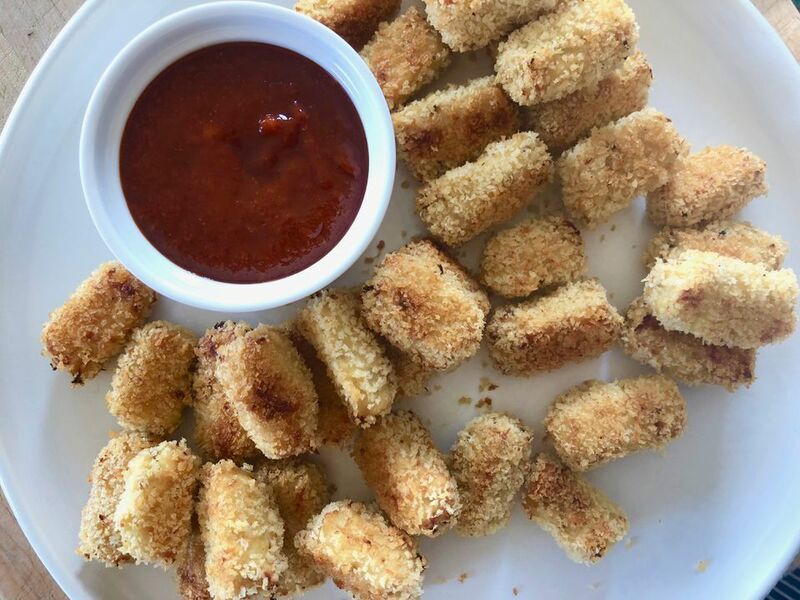 With damp hands, roll each piece into a tater tot shape, roll in the breadcrumbs to coat, and set onto the baking sheet. Repeat with each piece. Spray the tots with oil and bake until browned and crispy, about 50 minutes. Turn the tots over halfway through baking.